Complete innovation for the interior design of your MINI! 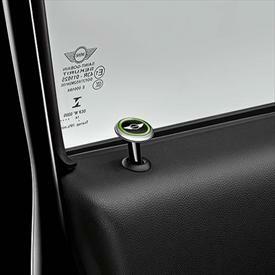 With EIGHT styles to choose from, the door lock cap is the perfect finishing touch for personalizing your MINI! Dealer pricing will be displayed for items once they are added to the cart. Each price is the suggested retail price and is subject to change. Price excludes installation and taxes. Check with your authorized MINI dealership for complete accuracy of information and product availability. Unlike our convertibles, we don't believe that your personal information should be Always Open for the world to see. We appreciate the trust you place in MINI and would never want to jeopardize that trust in any way. We respect your privacy and are committed to protecting the security of your personal information. Which means we will never rent or sell your personal information to anyone. On top of that, we work hard to make sure that we, as well as all the retailers and contracted business partners we work with, maintain physical, electronic and procedural safeguards designed to protect your personal information. And if you ever have any questions at all regarding your privacy, large or small, practical or just philosophical, please don't hesitate to contact us. WHAT INFORMATION DOES MINI COLLECT? As part of keeping our MINI Insiders in the loop, we collect and save "personal information" such as your name, address, email and phone number that you might have volunteered while signing up to become an Insider. HOW DOES MINI USE MY INFORMATION? The primary use for any information we collect is to help facilitate efficient and relevant communications regarding MINI products and services. We would never intentionally do anything to jeopardize your trust, including renting or selling your personal information. DOES MINI SHARE INFORMATION WITH ANYONE ELSE? From time to time we share information with other members of the BMW Group to help provide offers for products or services that may be of interest to you. Members of the BMW Group include, BMW of North America, BMW Financial Services, BMW Bank of North America, and BMW Insurance Agency. We also occasionally share personal information with non-affiliated companies that provide services on our behalf. All of these companies are contractually obligated to keep the information that we provide to them confidential and to only use it to help provide the specific services we've asked them to perform. We also share personal information with MINI Dealers who are distinct entities and have their own privacy policies. We do everything we can to protect your personal information. This includes deploying encryption technologies and user authentication procedures that are designed to keep your data secure. We also limit access to personal information so that only authorized personnel and contractors who need access to perform their job and are contractually required to keep your information secure, are able to see it. DO YOU GUYS TRACK USAGE OF YOUR WEB SITE? We collect anonymous information about every visit to our site by session tracking. We may link this tracking to personal information that individual visitors voluntarily provide to us. We use this information only to determine how to make future visits more convenient and productive for all MINI enthusiasts. We use third party advertising companies to serve ads on our behalf across the Internet. To measure and improve the effectiveness of our ads, these companies use cookie and 1x1 pixel.gif (web beacon) technology. They do not collect any personally identifying information about you. They collect only anonymous information about your visits to MINIUSA.COM and other web sites. The third party reports the anonymous data to us. MINI may link this data to the personally identifiable information that you may choose to provide to us for the purposes of better serving you. When we at MINI USA link this data, it is treated under this policy as personally identifiable information as described above. If you would like more information about this practice or to opt-out of it, click here. WHAT'S THE SKINNY ON COOKIES? Cookies help provide a luxury and convenience similar to that of memory seats. They save you the trouble of reentering certain information in some registration areas, help to deliver content specific to you, and track which sections of the site are most popular. The permanent cookies we use are elements of data stored by your browser. They are used on the site to access personal information that you may have shared if you decided to Become An Insider. For example, in a registration area requesting your name and e-mail address, permanent cookies allow us to fill in that information for you. Our use of permanent cookies is controlled and guided by our policy on confidentiality shown above. In addition, we use Flash cookies in connection with our website. Similar to browser cookies, Flash cookies are used to remember settings, preferences and usage, but are managed through a different interface than the one provided by your web browser. If you want to delete Flash cookies, please access your Flash Player settings management tool available on Adobe's web site. However, if you do not accept cookies (whether browser or Flash cookies), you may not be able to use all portions of our website or all functionality of the website. Whether it's photos for a contest, great motoring stories or just a question you've emailed, we ask that you always use good judgment whenever you send us anything. Ultimately, any material we receive can be considered public and non-confidential and we reserve the right to use anything submitted to us without limitation. If changes to our policy are made, we'll post revisions right here, to our web site. So check back on a regular basis if you want to stay on top of updates.